Though I’ve never read Samuel Beckett’s novel, The Unnamable, I recognize the above quote as describing a place I’ve been all too many times in my life. It is that place of loss or illness or tragedy where, despite the support of loving people, you feel totally alone. It is that place of darkness where screamed and whispered cries of “Why?” are met with deafening silence—because there are no answers. It is that place with no road map out. It is that place you feel is impossible to survive—and yet, you do. It is in places such as these, where the seeds for extreme gratitude are sown. Last week I wrote about the power of mindful gratitude—how a practice of intentionally seeking out experiences for which to be grateful can bring us peace in stressful times. In previous posts, I’ve written about the value of perspective. It is in looking back that we often see the gifts that our disappointments and losses eventually brought us—valuable experiences and relationships that we would not have had without going through the pain—and which we would never choose to give up. Just recently I had an epiphany about what I’m calling extreme gratitude. More than only being grateful for a lovely gift or delightful experience, it is discovering ways to be thankful for experiences we usually wish had never happened. Extreme gratitude requires much more than thought and action to accomplish, and takes perspective to another, higher level. Since this idea is so new to me, I’m still in the processing phase myself. But I want to share two examples of extreme gratitude from my own life. My epiphany occurred two weeks ago, on a Friday. I was at my bank, talking to a young woman who had just discovered that her identity has been stolen. Naturally, she was scared, confused, and overwhelmed. I listened to her story then told her mine—about my purse being stolen in July. I told her what has helped me, and what I know she can do to protect herself. I was able to reassure her that the feelings of shock and violation do start to fade—that she would be “okay.” I offered to be there if she needs me and gave her a hug. She was smiling when we said goodbye. As I walked away, I felt the first tiny twinges of gratitude that my purse had been stolen. It felt good to have been able to truly empathize and help someone who so needed my comfort—but did I actually feel grateful that my purse had been stolen? I mentally poked at the feeling to see if it would go away, and it didn’t. Huh! I decided to deliberately explore a more major event in my life—breast cancer. A diagnosis of breast cancer, twelve years ago, earned me membership in a club I never would have chosen to join. Since my diagnosis, I’ve supported the cause in every way possible. I’ve met many other survivors and strugglers with whom I’ve shared wisdom and commiserated losses. I’ve urged women I know to get suspicious lumps checked out and celebrated with them when the diagnosis was benign. But, around this time last year, a woman very dear to me received a diagnosis that was not benign. Although the stage of her cancer was the same as mine, her treatment was much more complicated. With every development and new piece of information, I was able to help her sort through and ask the next question, make the next decision. Together, we cried and prayed and asked “Why?” Our questions were met with silence, but, ultimately, she triumphed over her cancer. I was able to support her through her experience, and I was able to do it from an entirely different place than if I had never gone through it myself—for which I am grateful. On a related note, November 7, I attended the gallery opening of my friend Sandro Miller’s exhibition, Malkovich, Malkovich, Malkovich: Homage to Photographic Masters. I met Sandro Miller in 2003, the year after I had been diagnosed with breast cancer and received (an innovative) radiation treatment. Sandro was photographing an ad campaign for Evanston Hospital’s innovative therapies, and I had been asked to participate. Because I knew my participation could possibly help other women who were struggling with treatment options, I agreed. The ad campaign took me totally out of my comfort zone, but at the shoot, Sandro was respectful and kind and made me feel totally safe and relaxed. When I finished East of Mecca a few years ago, I reached out to Sandro to ask if he would photograph me for my cover. But I had just discovered that Sandro is wildly famous, and I worried that he wouldn’t be interested in a small project like mine—or that I wouldn’t be able to afford him! Sandro not only said “yes,” he gifted me with his valuable time and talents. The shoot was a lovely experience, and now I have the most beautiful portrait of myself on my book—taken by one of the best photographers in the world! Recently, Sandro came back into my life again. While I cannot disclose why just yet, our friendship has once again resulted in an incredible opportunity for me. On November 7, after the gallery opening, my husband and I were invited back to Sandro’s studio for an amazing party where we danced the night away. During those hours, I was acutely aware of being grateful for all the circumstances that brought this incredibly talented, generous, and lovely man into my life. Please visit Sandro’s website to learn more about him. As I said earlier, I am still processing this very new practice of extreme gratitude. Already, I know it will not apply to all the negative things that have happened in my life. I will never be grateful that my daddy died when he was only fifty-eight. That profound loss will never make sense to me, and I will forever mourn. And there are so many other experiences I know I will never be able to reconcile—in which I will never find even a glimmer of gratitude. But I now have another strategy for looking back over my life—another possible way of reconciling tragedies and losses—like panning for gold in a muddy stream. 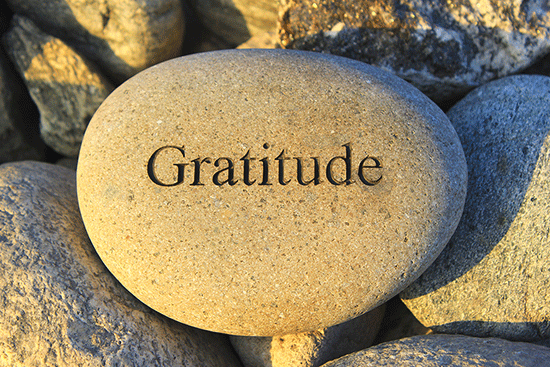 In last week’s post, I promised a possible strategy for beginning the practice of extreme gratitude. What I plan to do is draw a timeline of my life, thus far. I’ll mark important milestones and highlight joyous celebrations, but I’ll also note mistakes I’ve made and things I’ve long thought best forgotten. And, in the process, I’ll try to be kind to myself. If you embark on this journey, I recommend that you do the same—look back in kindness and be self-forgiving. This is all part of the gift of extreme self-care. At some point in the future, I will write again to tell you what more I’ve learned and share my progress. In the meantime, I encourage you in your own quest for the peace and empowerment found in the practice of extreme gratitude—and I would LOVE to hear your stories. 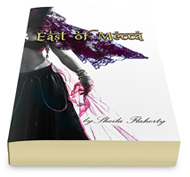 I’m offering a personally-inscribed copy of my novel East of Mecca from December 1st, 2014 to December 15th, 2014 for just $15.00. More information can be found here.